I took a big risk on these gorgeous pop culture cups. There are Star Wars, Muppet, Smurfs, and more from the 1980s. I hope they'll do well on eBay. Anyone have information to share on these cups? The lovely green bank lamp was from Goodwill. I found this lovely 1950s kitchen (?) table at a small local thrift store. I'm always on the prowl for new furniture to sell or make-over. There's a leaf underneath that you can push out and the top can be removed effortlessly. It's very lightweight and fun to wheel around. I'm selling it for $25.00. And the table top's finish is a very mod turquoise with golden specks. I found the brass unicorn and vintage decanter set (with super sturdy case, actually dropped it and the glasses inside remained intact!) at a different local thrift store. 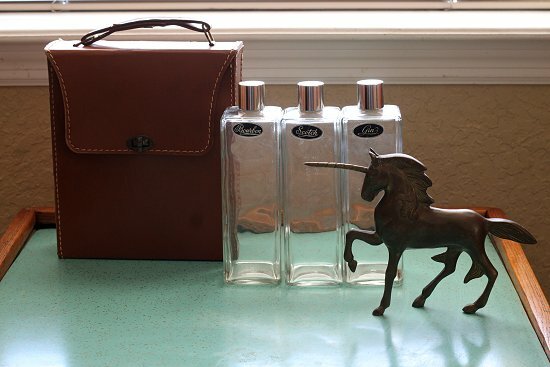 I'm selling the decanter set for $25.00 and the unicorn for $9.50. The writing on the decanter stickers is gorgeous! 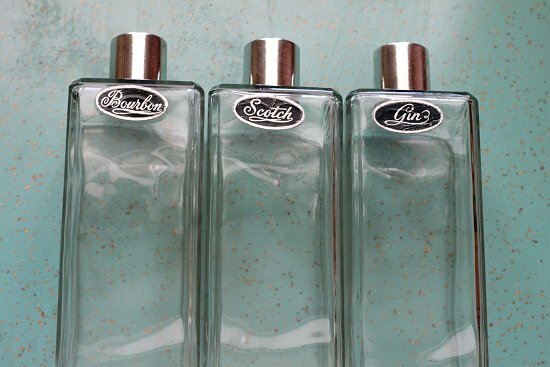 But when I really look at this, you're an insane lush if you need three huge bottles of bourbon, scotch, and gin on-the-go! Definitely a better piece to look nice on your retro home bar. 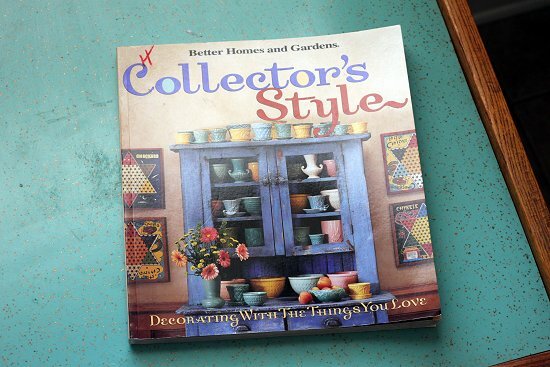 And I found one of my favorite "thrifter's" books, Collector's Style. 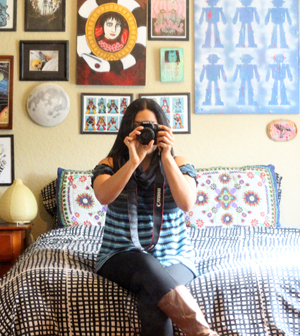 With fun photos of how to display our vintage collections. 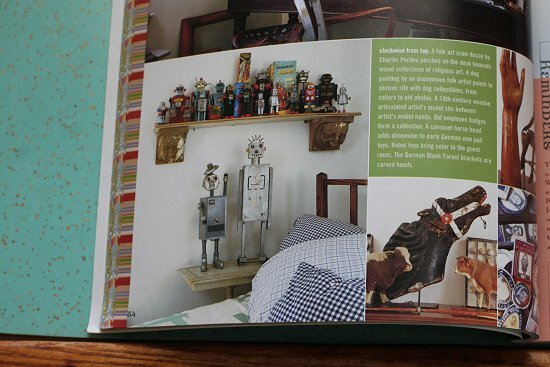 Of course, I drool over the robot photos! I already own a copy of this book. If no one bought it for $7.00 this weekend I may host a giveaway. The mod serving tray was one of my first finds at the start of the year and it's still lingering around. 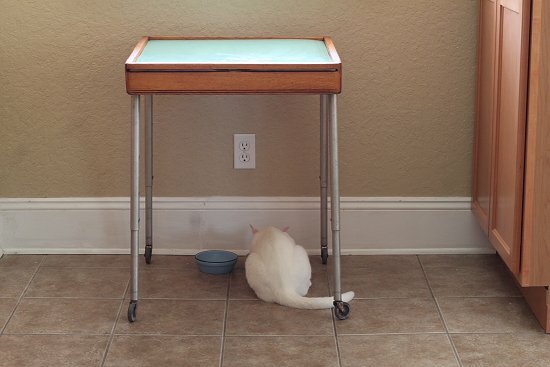 I found the wire table and thought I might have better luck selling the tray as a mini table. I'll let you know how it goes! I have that same bank lamp.I didn't like the brass though, so I spray painted it oil rubbed bronze.Much better now. Pretty liquor bottles and I love the novelty glasses.Are the little bitty ones shot glasses? The small ones up front are more like small tumblers. They feature antique imagery in different colors. Definitely will follow-up with a close-up of all the glasses. Star Wars glasses? Really cool! I need to take more close-ups on the glasses, they're gorgeous. Great finds Van!! 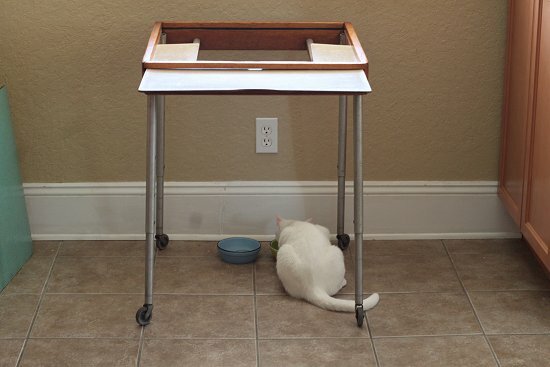 I love the little table....anything with wheels definitely gets my attention! I will also be taking a little looksie at the book if it's still in your booth today. I haven't seen that one so I would love to check it out! I went to a few sales Friday and nabbed some neat finds and I also went out for an hour or two Saturday morning. My finds include a first edition Julia Child book, an awesome humidity reader and thermometer set which have already been tagged and put in the booth, a humongous vintage paper cutter (I'm a sucker for anything office-y), and a big vintage wicker rocker that I'm delivering today. I went to the sale Friday and passed it by, went back Saturday, my truck was empty and it was half price...had to have it this time. Those smaller glasses in front look like swanky swigs. Hard to tell in the picture. I would have bought them all! Great find! I once sold a set of smurf glasses on ebay for over $100! If I remember right, I think there were 12 different kinds. It was a few years ago. I go weak in the knees over glasses and just bought a vintage 50s cabinet that is perfect to display all our glasses. We use them, too, and with 4 kids, they break now and then, so I'm always buying them whenever I see them. I can't tell which Star Wars glasses you have for sure from the photos but I've sold some for decent money on ebay.. if you let me know what they are I can see if they're what I sold and give you more information? Leave me a comment on my blog! Sure, I'll take a better pic for ya and leave a comment. Thanks for your help! Thanks for the kind words! :) And those finds, amazing! I'd love to see the picker's paradise you inhabit. 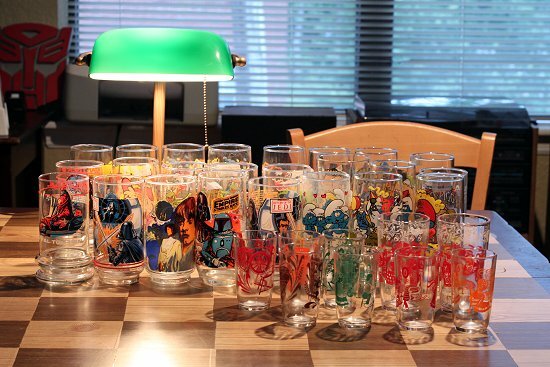 I love all the pop culture glasses (of course!). The smaller cups in the front, I can't see them that great, but I saw similar ones at an antique market on the weekend & they had been priced at $8 each. I thought they were cute & had to take a peek at the price. As far as the Smurfs glasses go, I'm not sure if you have the full set of 8? I believe full sets go from the $20-$30 range for the most part on eBay. Maybe they'll fair better in one of your shops? I see antique malls here charging $6-$10 for these glasses. I always have trouble selling glasses at antique malls here. I've asked around and it could be that people associate them with thrift stores instead of antique malls. I may try it out though, who knows? Worth a try, I've never tried to sell pop culture glasses in the shops. And would love a thrift link up on your blog! Much more readers than mine.. I love the tiny juice glasses. I have two similar ones that were my grandmothers from the 40's or 50's. My mom thinks they used to sell them with pimento cheese spread in them. Thanks for the lead on those! I love the antique designs on them. I think your "kitchen table" is actually something they called a Baby Butler from the 1950s and early 60s. My mom had one for us kids growing up. It had different surfaces that slid out, including one that was a chalkboard on one side with the alphabet around it (as I recall...I was pretty young). Do you have a piece with a u-shaped cutout? That was a space for the seat that was attached. You'd put the baby in the seat and feed him/her, or they could use it as a play table. 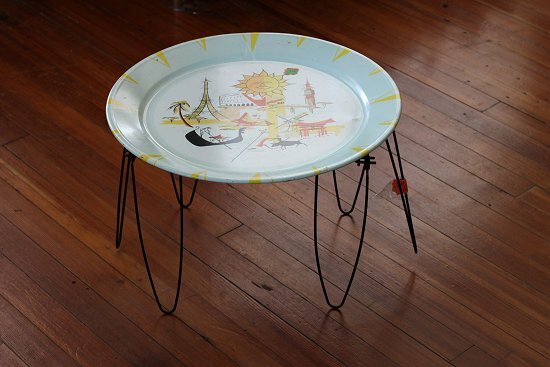 When the baby grew up, you could put one of the solid pieces in place and use it as a portable table. I think they're kind of rare now. Lucky you! Ah ha! That's exactly what it had underneath, good to know what it was. Definitely had some pieces missing. I already sold it for $25 at the antique store. Thanks for the positive ID on the old piece. i had that decanter set. sold it $35 on ebay. great Christmas gift! Ebay can get you a full living. I went from my own closet sales to a 1500 item store. thanks for all the antique mall tips. just opened my booth so lets see how that goes! I'm definitely feeling better and better about opening up an eBay store as soon as possible! Great finds! That mod little serving tray is so cool! It's really cool how you can gather so much info on items from so many different people. I would have never guessed that table had so many uses... Man, the interwebs is a wonderful thing! Do you still have that little table? I'm interested in something that will hold a laptop and a few things and slide into a corner where currently I have a secretary with the flip down writing surface and one thousand tiny drawers. I need a clutter solution, and the rolling table looks like it would work. Sorry, it sold! It was a beautiful piece! Glad it helps! I can't wait to make more Grab bags for the holidays!